THE Christmas decorations are well and truly out in the shops and have been for a number of weeks. End-of-year Christmas parties are under way and cooks are beginning to prepare for the festive season by getting their puddings and Christmas cakes ready. Buderim cake baker extraordinaire Phyll Gomes is one such cook. And with a husband in the truck business, her skills certainly comes in handy this time of year. “I'll probably try to make a small Christmas cake with an edible Christmas card picture on the top for each of the contractors,” she said. For her Christmas cake, she follows a fairly traditional, rich boiled fruit cake recipe, but says there is plenty of room to experiment. “You can play with that by washing out your marmalade jars which adds a bit of a different flavour,” she said. Although it's not only reserved for the festive period, her quick and simple fruit cake is legendary among her friends and family. “It's a real quickie: you just throw it together overnight. It's very simple,” she said. “You soak a kilo of mixed fruit in two cups of tea or coffee overnight. Then in the morning add two cups of self-raising flour and 350g of fruit and nut chocolate finely chopped. “That's it. No eggs, no butter. A slight variation on the recipe is to use rum and raisin chocolate instead of fruit and nut. 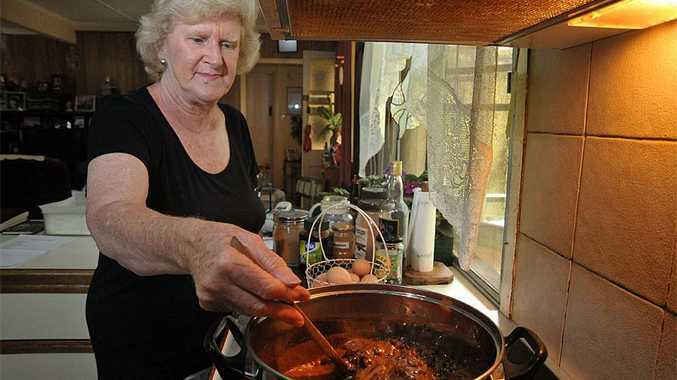 The recipe was given to her by a friend five years ago and she has been cooking it for adoring mouths ever since. But fruit cake is not her only speciality. Although lately she hasn't had as much time to bake as she'd like to, Phyll makes wedding cakes and picture cakes (with edible photos on top) for friends, and comes from a baking family. Phyll has several favourite cake mixtures including carrot cake and her specialty biscuits. “I have a biscuit recipe that everyone loves. They're called ranger biscuits,” she said. “It was given to me by my mother-in-law who was American.